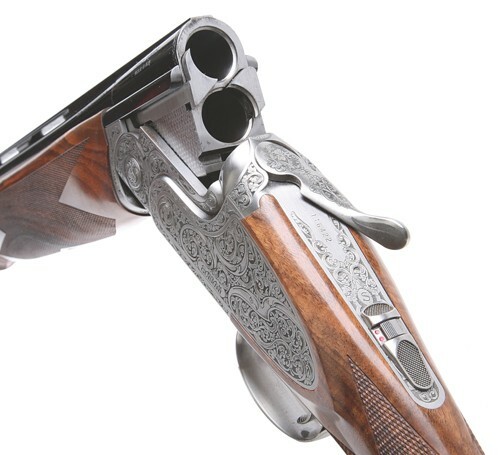 Caesar Guerini has done it with a wide range of good quality shotguns for clay and game shooters that balance and handle nicely, look good - and don't cost the earth. In fact they represent real value for money. The Caesar Guerini Maxum shotgun featured this month is a little unusual in that it comes with much longer-than-average barrels in the form of 34in tubes fitted with extended multi-choke tubes. It’s definitely a gun that will make long barrel fans sit up and take notice thanks to its balance and handling qualities! The Maxum has been kitted out with some pretty looking woodwork that’s been gloss oil finished. Wood quality is very good, the wood to metal fit is excellent and the stock is finished with a small, smooth, black recoil pad that doesn’t snag on mounting. Stock length is 14.3/4in with acceptable drops of 2.1/8in and 1.1/2 at heel and comb. The gun carries 1/8in of cast off for the right-handed shooter. The fore-end has been shaped in the traditional Schnabel manner and fitted with a neat release button at the front of the wood. This push button arrangement is in the style used by British makers and gives the gun a real quality look. The barrel set has been built on the monoblock principle and then treated to a very deep gloss black that looks really good to the eye. Inside, the makers have gone for 2.3/4in chambers and treated them to long forcing cones which should help improve pattern quality. If you are now using steel shot cartridges to keep ammunition costs down then you’ll be pleased to hear that the gun has been subjected to special steel shot proof. Both the top and side ribs are ventilated to maximise the cooling area and also help keep the weight of these very long barrels down to an acceptable level. In fact it weighs in a fraction over 8lb. The 10mm top rib is parallel with front and mid sight beads. The barrels hinge on stub pins in an action frame whose walls also carry decorative sideplates. The action frame has been given a silver ‘coin’ finished to really show the engraving at its best. 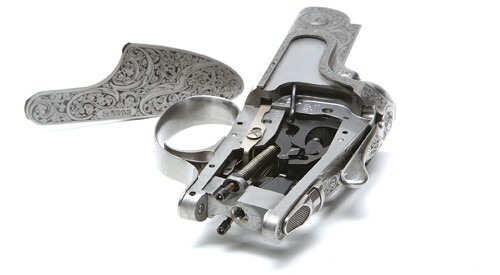 The scroll and ribbon engraving is a very striking feature of this gun because it completely covers the sideplates. The engraving is designed and executed by the famous Giovanelli engraving house. The safety catch button also incorporates the barrel selector for a well made mechanism that follows traditional principles, in this case hammers being hinged at the bottom of the trigger plate and powered by captive coil mainsprings. 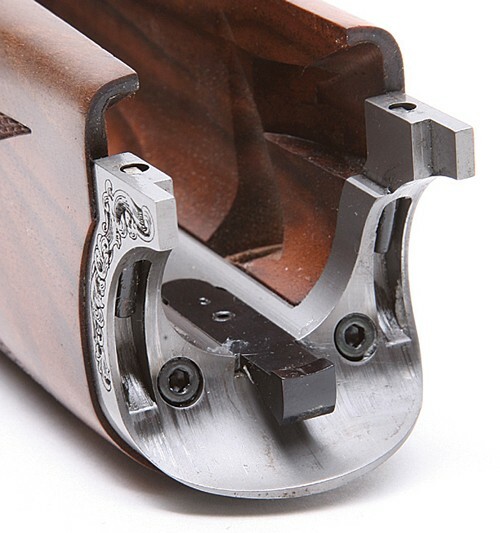 These rebound to prevent the striker dragging on cartridge heads when the gun is opened. The sears are suspended above the hammers which carries a double bent to prevent the gun firing if accidentally jarred or dropped. There is also a disconnector to take the selector away from the sears as soon as the gun is opened. The mechanism works by inertia for the second shot pick up. Each gun comes with an ABS case, accessories and six extended chokes which have knurled ends to make removal and fitting really easy, key is also provided. The Caesar Guerini Forum is a roaring success in the US, but how will the shotgun fare in British hands? Secondhand Caesar Guerini Maxum gun review: If you wished to revive the British shotgun industry, what would you build? This is a very pretty gun which is well made and handles surprisingly well considering the length of the barrels. It isn’t in the slightest bit muzzle heavy and points and shoots nicely. Considering it’s hand finished this gun represents great value for money.